Online Evangelist Training and Certification – SPSE offers a training course in catechesis and evangelization to help you learn the language of the Church and what she expects of her evangelists. SPSE certifies its evangelists who have completed the training and have experience out on the street. Each local Team Director is required to take these catechetical courses but SPSE encourages all Catholics to take them as well, even if they do not intend to become a street evangelist. SPSE also offers live training for groups that are interested. Materials for local teams – SPSE provides signs, Rosaries, CDs, business card templates, and other materials to each local team. If you would like to get involved with a SPSE in your area, or would like to learn more about starting a team of your own, visit the Get Involved page and fill out the form. St. Paul Street Evangelization also encourages every Catholic to join the conversation by following them on Facebook and Twitter, and by joining thousands of other Catholics in their Prayer Warrior and Apologetics Groups on Facebook where you can learn more about the Holy Catholic Faith and pray for the conversion of the culture. St. Paul Street Evangelization was formally consecrated to the Sacred Heart of Jesus and to the Blessed Virgin Mary under the title of Our Lady of Guadalupe, Patroness of the Americas, by His Eminence Raymond Cardinal Leo Burke. 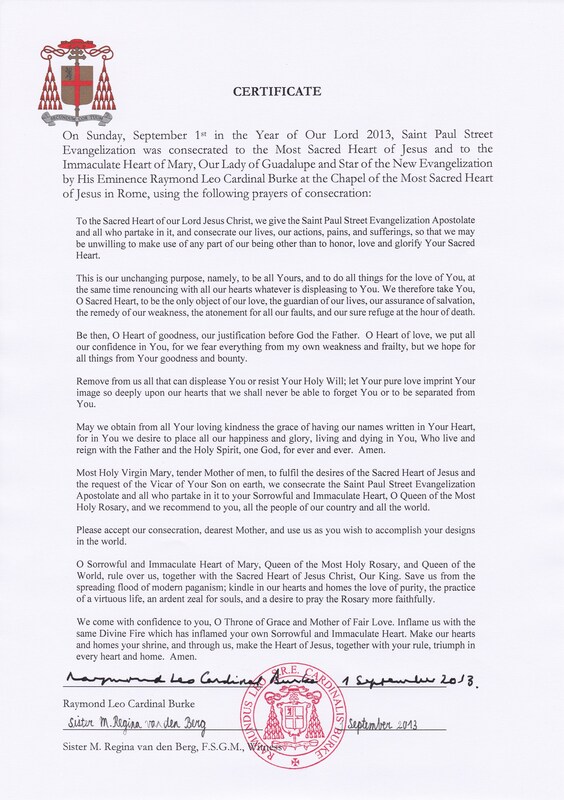 View consecration prayer here.